The very moment Obama decided that he didn't need an umbrella anymore. Who are these Umbrella Marines I’ve been hearing about since a few minutes ago? 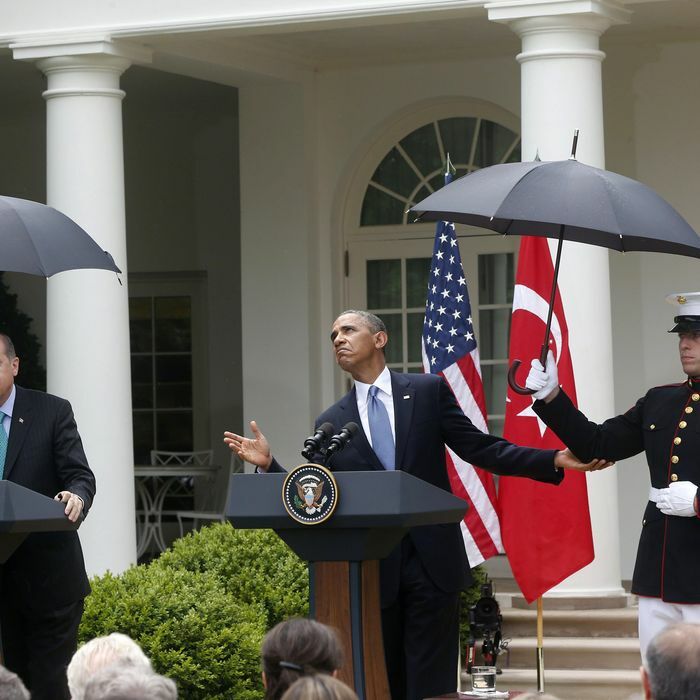 During a Rose Garden press conference with the prime minister of Turkey this afternoon, it began to rain heavily, at which point President Obama requested the assistance of two nearby umbrella-wielding Marines. That seems like kind of an awkward request — did Obama make any sort-of-jokes to lighten the mood at all? This sounds like it would be an interesting video clip to watch. Is there video of this incident? I feel like I could watch the part where the Marines show up with the umbrellas over and over and over again. Is there a GIF of this moment? Did the Marines continue to hold the umbrellas for the duration of the press conference? No. The rain stopped a few minutes later, and President Obama, seeing this, told the Marines that they were no longer needed (see above photo). How awkward would it have been, though, if the rain then started up again and Obama had to call the Marines back? Do Marines frequently hold umbrellas for the president of the United States? 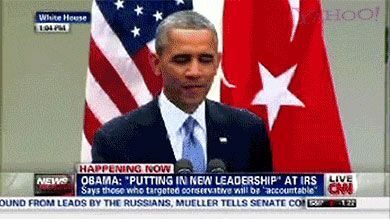 Did Obama or Turkish Prime Minister Recep Tayyip Erdogan say anything important about the ongoing war in Syria during the press conference? We don’t know, maybe. Probably not. Umbrellas.